The Regional Municipality of York got to experience its own eagerly anticipated Startup Canada town hall event today in Markham, at the Markham Convergence Centre (MCC). “We are very pleased to be hosting Startup Canada events in York Region, engaging hundreds of new and established entrepreneurs in an exciting discussion of how we can become more innovative and competitive as a nation,”said York Region Chairman and CEO Bill Fisch. The Startup Canada event was co-hosted by York Region Innovation Centre ventureLAB and facilitated by business journalist and Startup Canada Advisor Rick Spence. 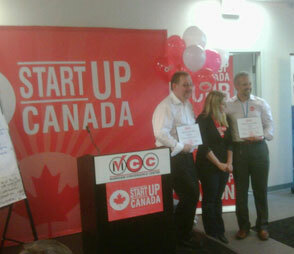 Jeremy Laurin, Victoria Lennox, and Paul Shaw at the Startup Canada event in York Region. Startup Canada set out to brainstorm community-driven ideas for supporting local entrepreneurship. Participants reported that today’s event did that, and more. On the Ontario leg of its cross country National Tour, the Startup Canada team’s unique multimedia road show created noticeable buzz in the audience of 80 entrepreneurs and mentors. Startup Canada hopes to engage 25,000 Canadians and 250 partner organizations across the country. It is notable that it was started by a couple of young people who simply decided to start a national organization and then go across Canada with it, driving a common entrepreneurial vision. Stephen Pollack, CEO of the Everest Acadamy/Everest On-Line Learning Centre presented the winning group pitch called Mentor-up for the entrepreneurial problem solving competition. It outlined a network of entrepreneurs supporting entrepreneurs from a problem, solution and funding vantage- all done in a half hour time limit. Pollack summed up the experience of many today, saying that “he hoped the event would show the government what it should do to take up the entrepreneurial challenge and that it wouldn’t always take take $100 million to do it”. Jonathon Shore is a principal at Mrcpartners, a Toronto based communications agency that counsels I.R., tech, social cause and political clients. He manages the blogging and news content posting and social media outreach as part of the communications team at http://venturelab.ca/.